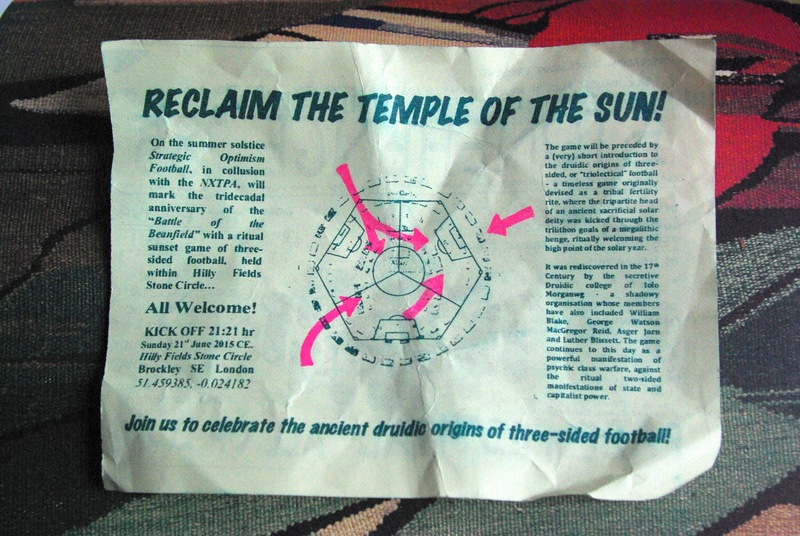 Reclaim the Temple of the Sun! – Celebrate the Summer Solstice! – Mark the tridecadal anniversary of the repression of the Stone Henge Free festival! – Experimentally test new theories suggesting three-sided football may have originally been based on ancient druidic fertility rites! KICK OFF 21:21 hr – Sunday 21st June 2015 CE. 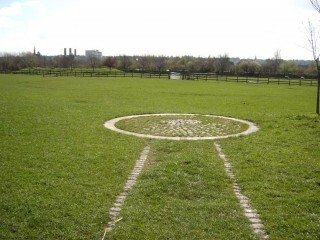 Hilly Fields Stone Circle, Brockley, SE London, (51.459385, -0.024182). Some friends of Strategic Optimism Football Club have been digging into Asger Jorn’s well-known interest in prehistoric monuments and rock art. Recently they uncovered evidence suggesting he may have derived his idea for three-sided football from material he uncovered in these studies into ancient druidic fertility rites. They argue that Jorn developed a belief that many stone circles had been used as ritual ball courts for the celebration of solar rites and that he in fact constructed three-sided football from his knowledge of these ceremonies. In the spirit of ‘experimental archeology’ – the testing archaeological hypotheses by replicating the feasibility of ancient cultures performing various tasks – some players with Strategic Optimism proposed putting these theories to the test. As 2015 marks the 30th anniversary of the repression of the long-standing Stonehenge Free Festival by police at the ‘Battle of the Beanfield’ in 1985, we thought it the perfect occasion to commemorate this event too (hence why a copy of the original flyer from Stonehenge 1985 was printed on the back of the one advertising this Brockley event). The game will be preceded by a (very) short introduction to the suggested druidic origins of three-sided football, which will start just after 9pm. Kick off will be on the stroke of sunset, that is 9.21pm sharp. Teams will be informally decided on the basis of who turns up. The game will finish when we get bored, or it gets too dark, at which point we’ll probably go to the pub.